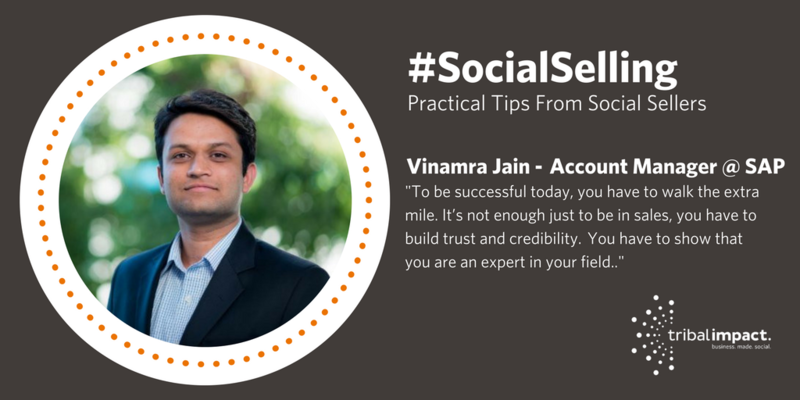 Social Selling blogs, I recently interviewed Social Seller Vinamra Jain - Account Manager for SAP in India. It made me realise that whilst despite some small cultural differences, the concept of putting relationships before sales is a truly global phenomenon. What struck me most about this interview was Vinamra’s use of WhatsApp. Most Social Sellers I meet use LinkedIn Sales Navigator, maybe Twitter, but Vinamra was the first person to mention WhatsApp. Tell me a bit about yourself, Vinamra. I’ve been working as a business solution expert at SAP for a year and six months of that were spent in the SAP Sales Academy in California, where I was introduced to Social Selling. I’m based in India and have responsibility for customers across the Metro region in India, part of the Asia-Pacific-Japan (APJ) team. I help to realise the capabilities of technology by solving business problems with niche solutions that use new technology. It’s very interesting that, often, what they see only as a possibility, is already a reality in many countries. I’m responsible for growing the business and also for helping existing customers get greater value from SAP. 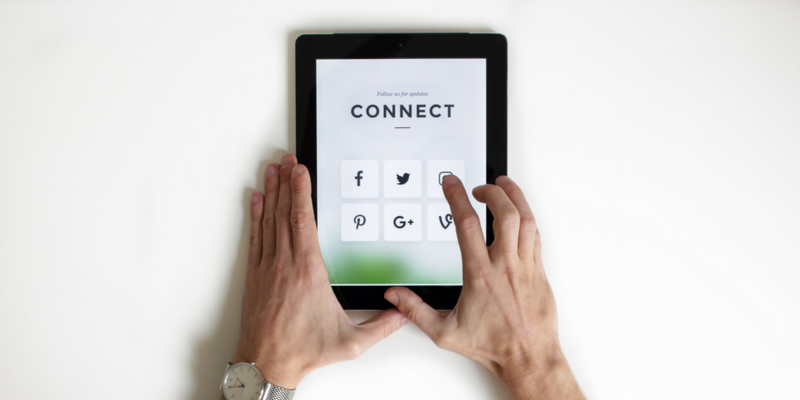 So, what is Social Selling in your words? Well, it’s about relationship selling. You use the technology you have available not just to reach people but also to build a personal connection with them. Be it friends, colleagues or your wider business network, reaching out allows me to create more awareness among more potential customers. You mention your personal and business networks: In many countries, they like to keep the two separate. What are your thoughts on that? I noticed this divide a lot when I was training in the US. There is much more of a division between networks. But not in India: business here is totally about relationships, whether they are personal or professional. That crossover is normal here so it doesn’t affect my credibility. People blur the lines between friends and colleagues because it’s really about human connection. If the relationship is good, then business is good. How does Social Selling help you? It helps to convert my pipeline. I use LinkedIn Sales Navigator to view a company and save leads then, in the future, I’m notified about them, so I can interact by liking, commenting or maybe sending an InMail. It’s never been so easy to find people. It’s a great tool. We now need to build relationships with multiple buyers in one organisation so it’s essential that we can spread our net more widely. With LinkedIn Sales Navigator, I can engage with people in this way, at scale, and target my time more easily. People are so busy, inboxes are overflowing: LinkedIn presents a gap with InMail to reach people who are otherwise swamped with email. Have you any concrete examples where you can confidently say Social Selling has helped you in your role? Yes, I can think of a great one. I had a target account that I was trying to engage with but I couldn’t get access to the people I needed to talk to. I used all the tools we just discussed and took a ‘nurturing’ approach by following and engaging with their updates and, since then, I’ve met them in person and continued to build the trust. How do you integrate social activities into your business day? Well, content sharing is key. I share an article update each day on LinkedIn. My trick is to do this in advance. I spend the weekend planning and I use a tool called GrapeVine 6. It’s a mobile app that comes up with great content, which is customised and personalised to my preferences. I can read, schedule and add my own perspective as part of the LinkedIn post, which is important because it further endorses my brand. What would you say to people who are not yet convinced about Social Selling? Well, mainly, I’d say that times have changed and the way people access information has changed. To be successful today, you have to walk the extra mile. It’s not enough just to be in sales, you have to build trust and credibility as well, and show that you are an expert in your field. Something amazing that I’ve noticed is that colleagues who have seen my approach working are now sharing more as a result. Just out of interest, is LinkedIn the only platform you use? I don’t use Twitter but I do use WhatsApp to communicate with most of my customers. It allows me to send a screenshot directly to individuals or groups. I can also link to videos. Plus, with WhatsApp, I can see whether the content has been viewed or not. I'm enjoying this series so much. I get to interview people from Argentina to Australia. From the USA to India. Yet, despite the geographical locations, the Social Selling concept is the same. It's focused on relationships, adding value and building trust. Vinamra's use of WhatsApp fascinated me. Another social network used to share visual content including infographics, video links and articles. WhatsApp enables Vinamra to share relevant content to a specific person or group of people quickly – a great way to bypass the busy inbox. Thank you Vinamra for taking part in the series.